We present a list of the Best-50 public IPv4 time servers by mining a high-resolution dataset of Stratum-1 servers for Availability, Stratum Constancy, Leap Performance, and Clock Error, broken down by continent. We find that a server with ideal leap performance, high availability, and low stratum variation is often clock error-free, but this is no guarantee. We discuss the relevance and lifetime of our findings, the scalability of our approach, and implications for load balancing and server ranking. Partially supported by Australian Research Council’s Discovery Projects funding scheme #DP170100451. (see Tables 6 and 7). URL to IP mapping of the servers in Table 4. 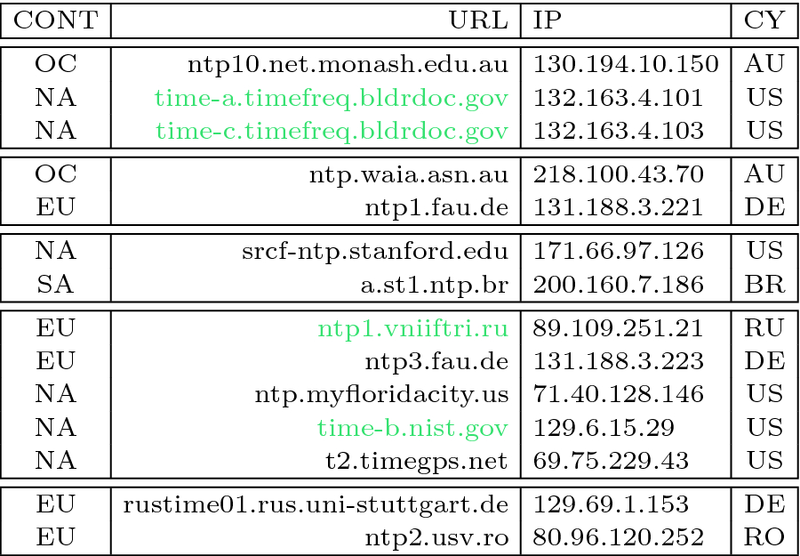 URL to IP mapping of the servers in Table 5.